I saw this book got mentioned on my friend Drewscape's facebook page and was immediately interested in checking it out because the cover with the funny drawing really caught my attention. And it's by Seo Kim (Tumblr | Twitter). 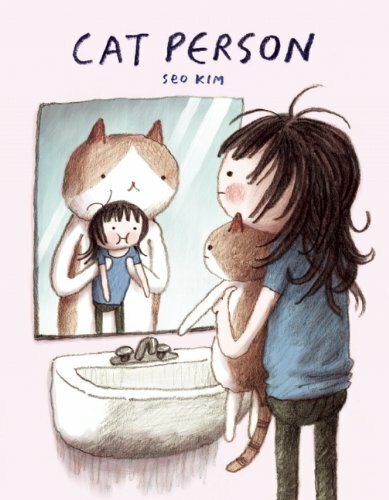 Cat Person actually a collection of short comics from Seo Kim, some of which were published on her Tumblr page. Now they are conveniently in a book so you don't have to dig through the archives. This is one of the funniest comic book I've read. I borrowed this book at the library and choked a few times while trying to contain my laughter, you know, to avoid any noise and awkward stares. The comic strips are about her cat Jimmy, herself and her boyfriend and other miscellaneous funny drawings. Some are just totally made up, but others I can see are real life inspired and funny because you can relate to them. This lady is a comic genius. And I love her child-like drawing style of pencils and digital ink. Definitely highly recommended to anyone who wants a laugh, regardless of whether you're a cat person, dog person or anti-pet person.